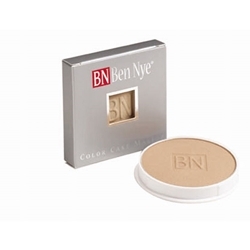 Ben Nye water-based Color Cake Foundations offer a sophisticated approach to traditional pancake makeup. Our Color Cake Foundations possess many useful qualities, including a diverse color range in a creamy, water-activated formula. Developed by a former Max Factor chemist, the Nye bases appear natural without chalkiness. Neutral-beige and olive tones offer variety and subtlety not previously available in Cake. Resistant to heat and perspiration, Color Cake is excellent in humid conditions and preferred as body makeup by dancers who give any makeup a workout. This foundation alternative is also great for sensitive and oilier complexions.